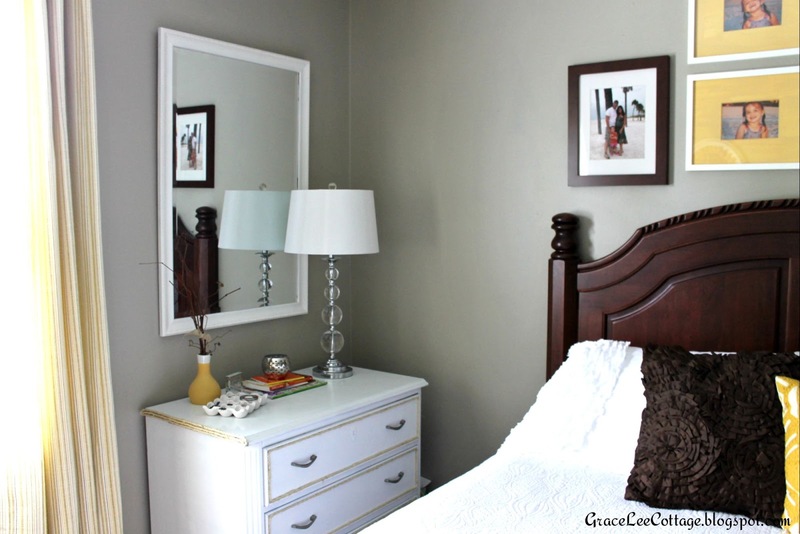 Today I'm sharing the progress of our master bedroom. The only thing master about it is that it has a larger closet then the other two bedrooms in our house. My daughter's room is actually a little larger. Okay, carrying on! As usual the shell of the room is pretty neutral. I'm always drawn to neutral colors, but I didn't want to create a boring room. 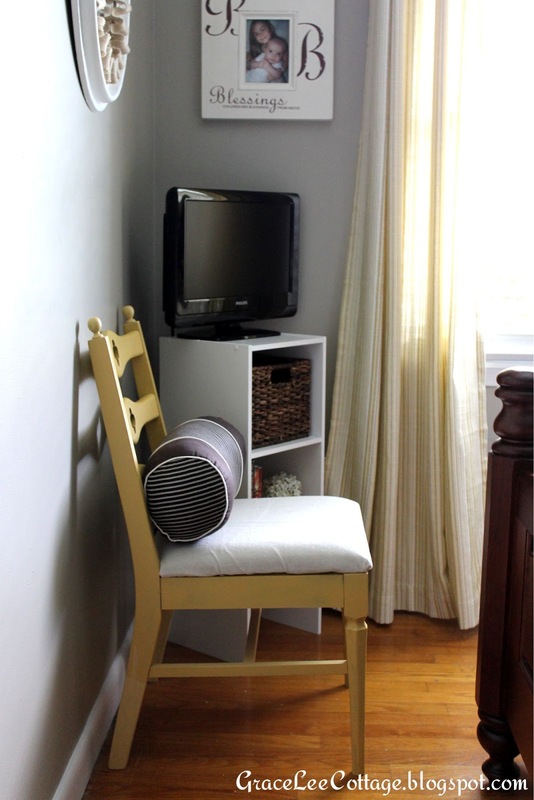 Pops of yellow liven it up, but preserve the calmness of the space. Our bed was a wedding gift from my husband's grandparents. We will treasure it forever. My mother-in-law gave me her old set of dining chairs. I love getting her hand me downs! I gave them each a unique makeover and they now live in different rooms of our house. Two of them are in my salon, the other I use as my desk chair. We recently added a T.V. to our room. I haven't found just the right furniture piece to set it on yet, so I'm just using something I already had for now. It's such a tight space, but hopefully the right thing will come along soon. Our closet doors are OLD and really need to be replaced. 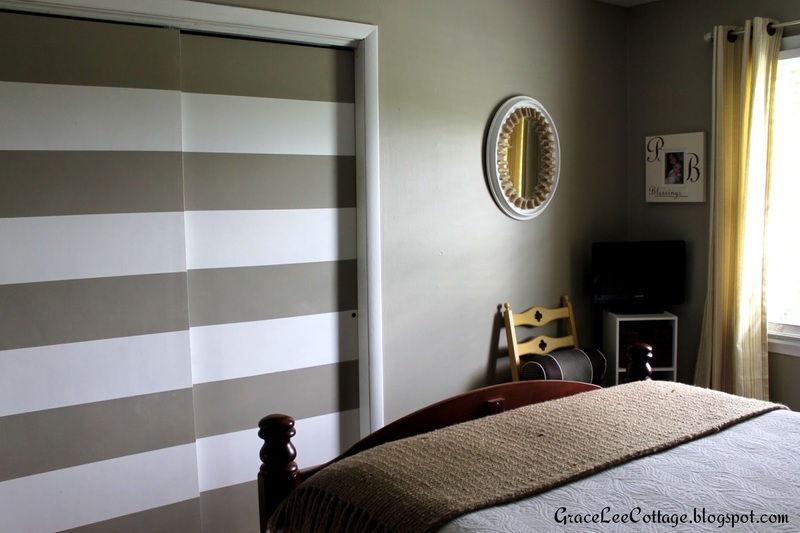 To hold me over I painted stripes on them using the left over wall paint. 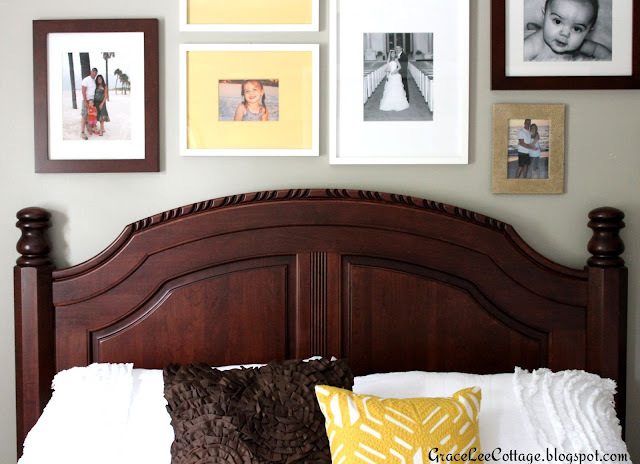 Above our bed I created a gallery wall. The two yellow photo mats were originally white. I painted them with a sample container of paint from Lowe's. I really need to update a few of the pictures. There are no pictures on this wall of my little guy! Isn't that always what happens with the second child! Poor fella! My husband's side of the room is all decorated in his racing stuff. Trophies, pictures, etc. His trophy collection was outgrowing our small shelf in the living room, so we had to move them. He is pretty awesome. On my side is the dresser I made over recently. I use it as a night stand too. The mirror above it is a little large. Hopefully I will find one that fits a little better. I just kind of wait for things like that to find me. It happens eventually. 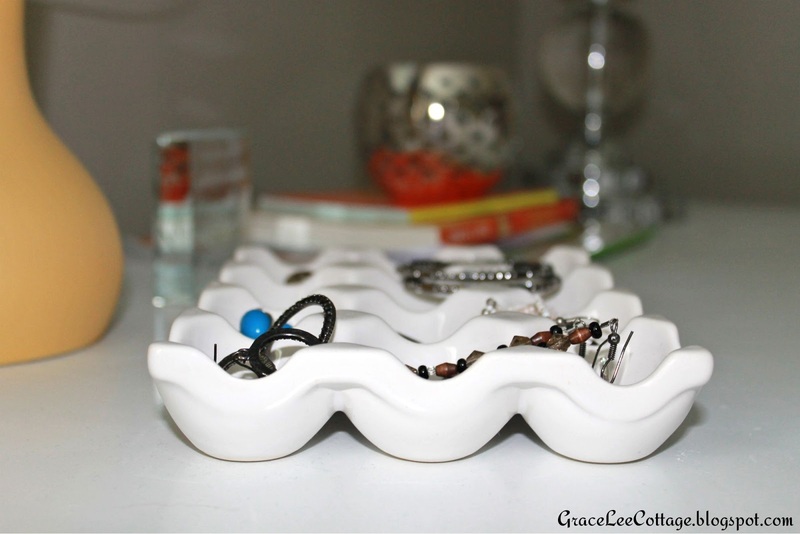 Egg crates make the best jewelry holders. I've seen this on so many blogs. 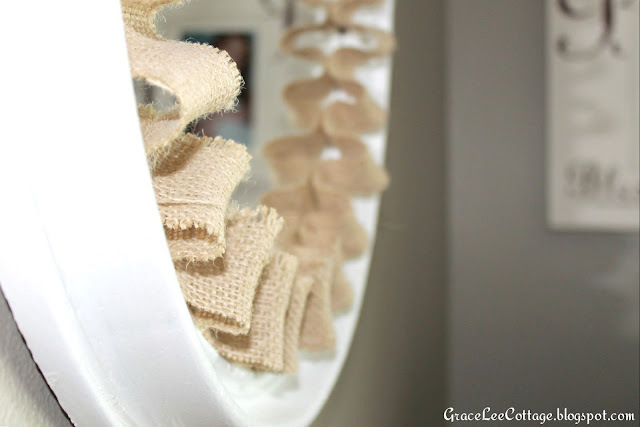 I created a burlap border around an oval mirror my grandmother gave me. I'll have to share a tutorial on that project soon. 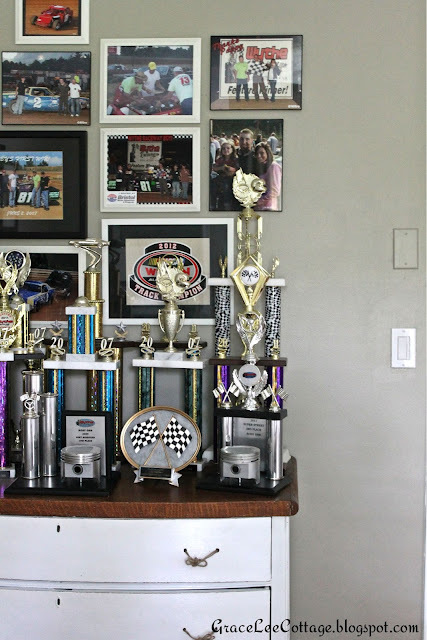 Trophies: Earned through lots of hard work and pure talent by my fabulous husband. If I'm forgetting something feel free to ask me! 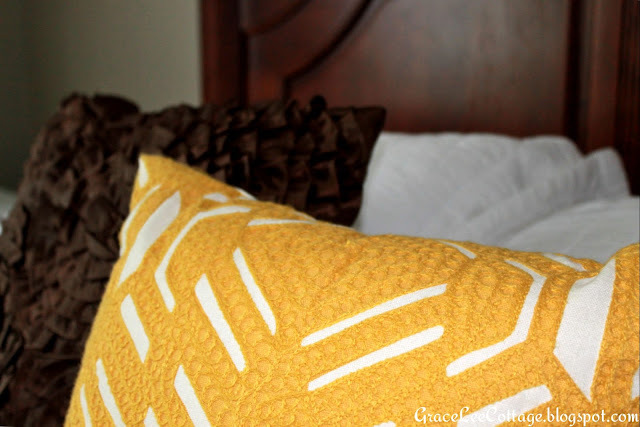 UPDATE: Click here to read my burlap mirror border tutorial! P.S. I just have to share something personal today. 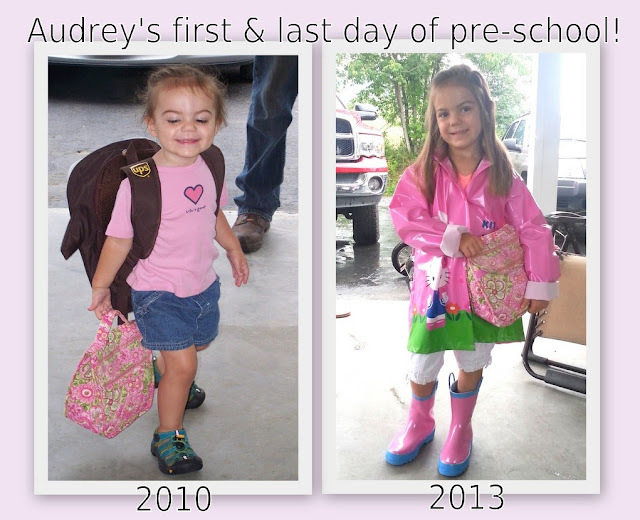 My little girl is starting Kindergarten in two weeks, and has just wrapped up pre-school. I couldn't be more proud of her, but this is a very emotional time for this mama! Love the master bedroom, the colors are so soothing. So I came over here from ABFOL to take a peek and I have been sitting here reading every post! My baby is sleeping and my to-do list is long but I could not pull myself away!!! I could go on with endless compliments and comments but I will instead get to my to-do list with all the inspiration you've given me. God bless you! How very kind of you! You have totally made my day! I know how valuable nap times are! Best of luck to you and your to-do list! It seems like my list is ways getting bigger instead of smaller! I appreciate you stopping by! God bless you as well! What a pretty bedroom! I found you through DIY By Design, glad I did! 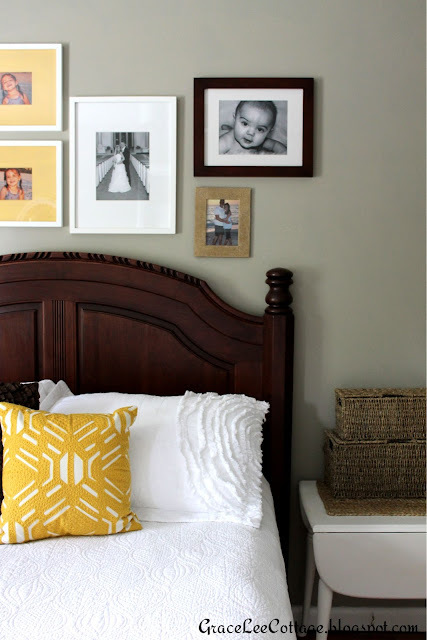 Love the touches of yellow too, can't wait to explore your blog a little more! Thanks Krista! 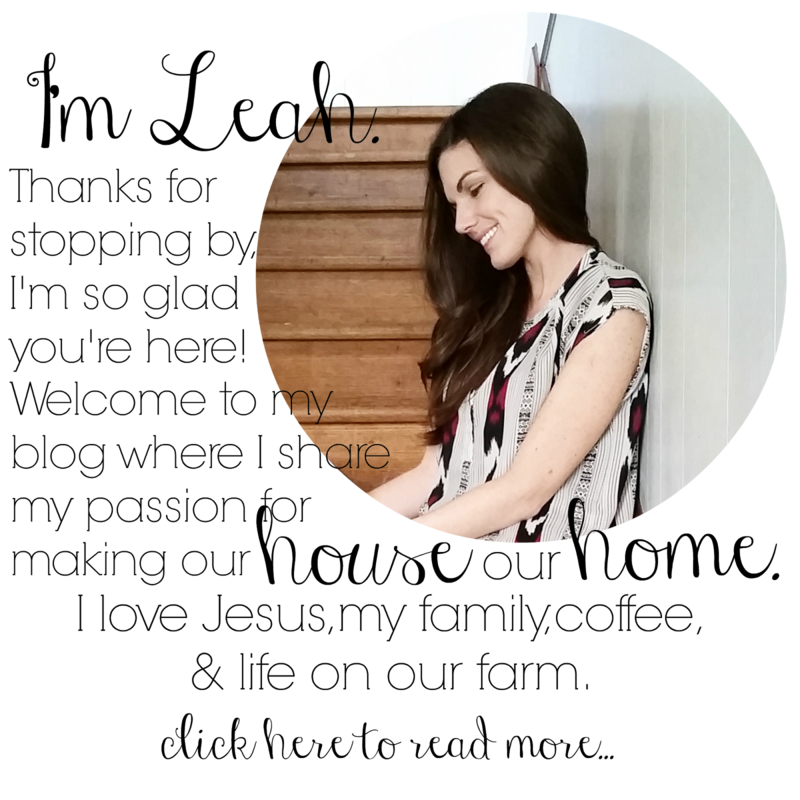 I just checked out your blog! Love all the colors you use throughout your home...so beautiful! You are very talented! Hi Leah! This is my first visit. I found you on Brenda's Cozy Little House Welcome Wagon Friday. So here I am welcoming you to blogland! You have a beautiful home and your projects look amazing. You've done a great job transforming your home into a space that works for you and your family. 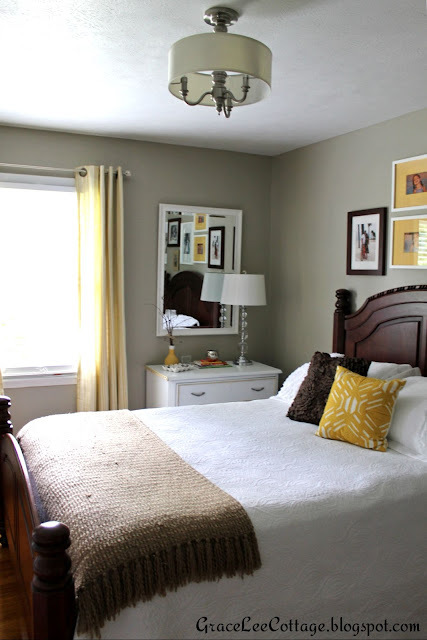 Love your master bedroom and your total bathroom makeover! I've often wondered how families do it with only 1 bathroom. I'm in the process of taking off 15 y.o. wallpaper in one of my bathrooms yuck! Hi Sandy! Thanks so much for visiting! Best of luck to you with your wallpaper removal! 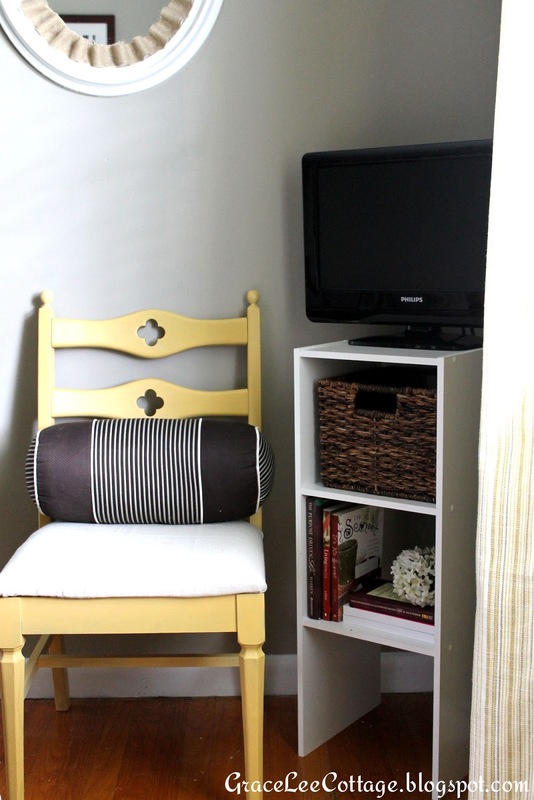 That's one project I haven't had to attempt with our house, thankfully! Have a great weekend! Leah, just a suggestion, you might want to turn off word verification. I bet you'll get more comments because it's frustrating to have to keep attempting to type in the letters in order to leave a comment. Thanks for the suggestion! I wasn't aware I had that activated on my blog. I agree it is very frustrating! I'm always like "Oh Man!" when I have to do that when commenting on other blogs, so I really appreciate you letting me know! So pretty! Thanks for the inspiration! I'm working on our teeny tiny "master" right now! Love how yours turned out! Thanks so much! A smaller master is actually very cozy and warm :) I love the room size if only we had a master bathroom! Best of luck on your bedroom makeover! Thanks for visiting!